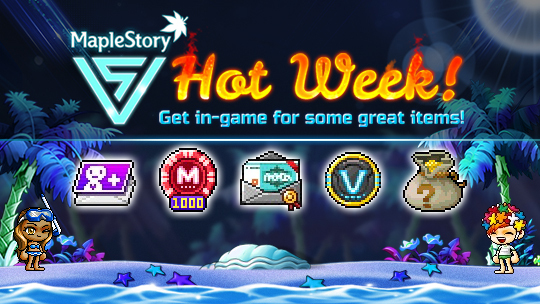 Yesterday, Maplestory released its new Hot Week which began from December 5 and end on December 11. It's a whole week of Hot Days, and gamers can get in-game for some great itemsduring the event. Log in each day with a character Lv. 30 or above, and click the gift box icon on the left side of the screen to receive a Gift Box, and then double-click the box in your inventory to open it. The Gift Box can be obtained once every day until midnight, and can be opened until 1:00 AM PST (4:00 AM EST / 10:00 AM CET / 8:00 AEDT) of the following day. Note: This event is available to players Lv. 30 and above (Zero characters must have completed up to Chapter 2). All rewards are for both Reboot and non-Reboot worlds unless specifically noted. Enjoy the whole week of Hot Days, receive your gift box every day!